Takeoff is one of those ‘have to do’ tasks that can take up far more of our time than we’d like, especially when we don’t know at that stage if we’ve got the job and will be paid for all those hours spent measuring drawings with a scale rule. However, there is a quicker alternative with Ensign's Ductwork On Screen Take Off software, which allows rapid and highly accurate on screen take off from electronic drawings, saving you time and the necessity to print the drawings. 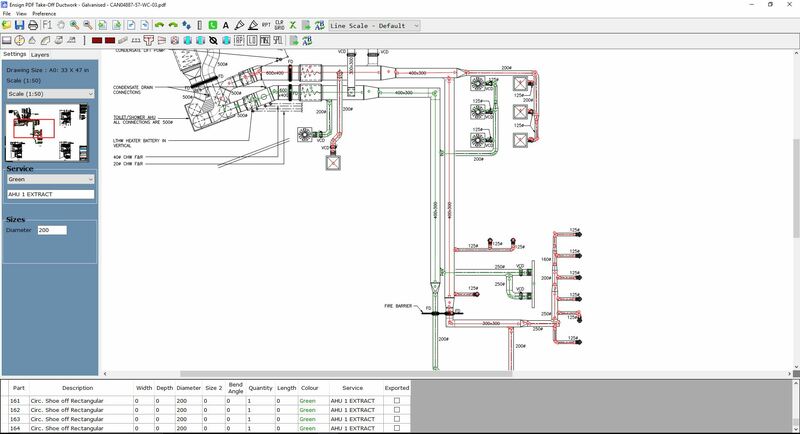 Our software is designed specifically for ductwork estimators, and we take your feedback into account when producing the latest version of the software, to ensure a highly responsive product that really does give you exactly what you need. Our takeoff software can measure runs of rectangular and circular duct & fittings, count grilles, fans, dampers, silences, change sizes, ask the software to automatically detect bends and generate access doors and more! And as you takeoff, the software will produce a takeoff sheet of all the items you need and what quantities are required to do the job, allowing you to generate collated or uncollated reports. Building drawings can often have many layers, and if you only want to see the ductwork layer for takeoff, it can be quite difficult to pick it out with all the other details. However, with our software, you can deselect all the layers you don’t need (if available), leaving you with a clear view of the ductwork and allowing quick and easy takeoff. Easily alter the scale of your drawings, highlight different parts in a variety of colours, zoom in and out using the mouse wheel, and even pause the takeoff so you can scroll to the end of your current section and then restart the takeoff to cover the whole section in one go! This incredible piece of PDF takeoff software will save you hours of time and effort and it’s quick to learn, intuitive, customisable and extremely accurate. 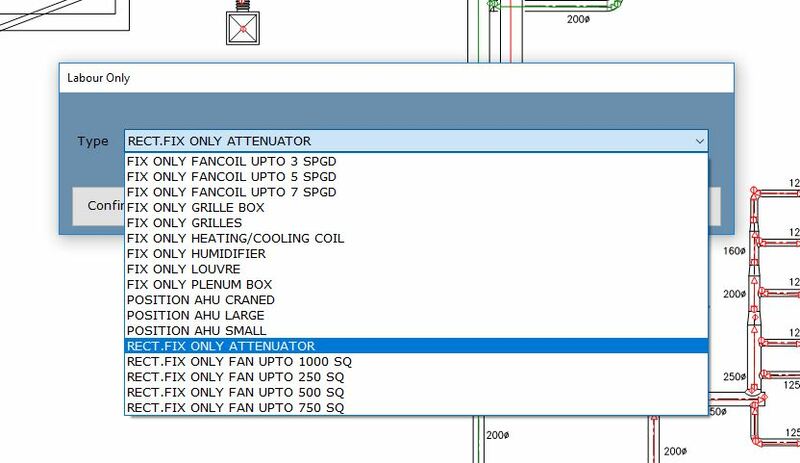 Export all quantities automatically into Ensign’s Ductwork Estimating Software to give you instant material and labour costs – the job is priced! Ensign is the only supplier of this software in the UK, with years of experience, and offers complete one-to-one training and highly experienced support from a friendly and professional team. You’ll also receive ongoing and frequent updates, to ensure you always have the latest manufacturer details and the latest version of the software. Why not give us a call today and start saving with the very best software for your business? All commercial software packages are developed for windows and cloud platforms. All cloud based programs are available online for mac, mac os x, ipad, windows and linux. Data can be exported in excel and most office software programs as all good small business software and management software should. Ensign has offered the best contracting office software in the UK since 1980. Our software solutions are designed to save you 80% of your estimating and surveying time, help you close more contracts at the right price and increase profits all in a simple and stress-free way. Ensign provides contractors with enormous time savings, cost savings and accuracy when producing their quotes. Since 1980 Ensign has worked hard to provide user friendly software and real value for money and is therefore used by thousands of contractors both large and small.